Planning your vintage wedding doesn’t stop with the dress and invitations. Give your vintage themed wedding the most authentic feel with vintage wedding flower arrangements. As an added bonus, many vintage flowers and floral elements are very budget friendly. Decide what vintage means to you. Some brides want a Victorian look for their vintage wedding flowers. Other brides get their inspiration from specific styles of the 1920s or 1950s. 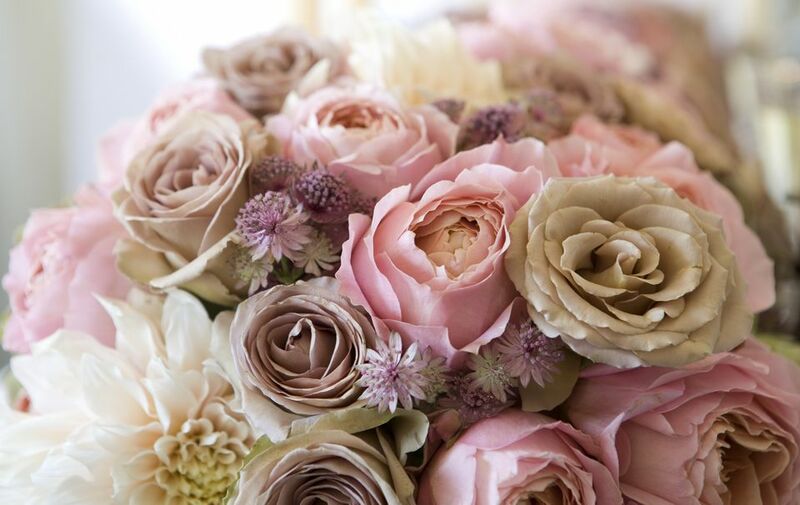 Be sure to communicate what you mean by vintage to your florist, because each era has a different interpretation. Moreover, although mixing containers and flower varieties is chic for vintage weddings, mixing different eras will throw off your guests and undermine your theme. Although there isn’t a clear cut list of vintage flowers that brides must choose from, there are some flowers that are decidedly not vintage. Many of the imported tropical flowers we enjoy today, like orchids and calla lilies, were too expensive to include in the kind of wedding flower arrangements our grandparents had. When choosing flowers, think about what your grandma grew in her garden. Scented stock, heirloom roses, peonies, and carnations are some old-fashioned standbys. You can also bring nostalgia to your wedding day with delphiniums, cornflowers, sweet Williams, dahlias, and sunflowers. If you plan to wear gloves during your wedding ceremony, consider carrying a pomander bouquet. Although these arrangements are often used as pew-end decorations in contemporary ceremonies, the movement in this bouquet will draw attention to your lacy gloves as you walk down the aisle. Cascade, or teardrop, bouquets are another alternative used by many brides in the first half of the twentieth century. Before there were plastic wedding cake toppers, there were flowers. Flowers are a natural choice to decorate cakes for brides planning a vintage wedding. The wedding cake flowers can look similar to your bridal bouquet or reception flowers, but they don’t have to. If your wedding flowers are particularly fragrant, you may want a less aromatic flower for your cake, like hydrangeas, bells of Ireland, or ranunculus. The art of candied flowers has been around for hundreds of years, and is a pretty way to add edible flowers to your wedding cake. Violets and pansies are most commonly crystallized in superfine sugar, but you can also use roses, lavender, or daylilies. Brides who have access to antique brooches or lace should consider incorporating these into the bridal bouquet. If a wedding gown handed down through your family is in poor repair, you may remove and use a piece of lace as a wrap for your bouquet. Handkerchiefs and doilies are also sources of vintage lace for your arrangement. As a bouquet element, your florist can mount an heirloom brooch to a floral pick to insert among the flowers, or can pin the brooch to the bouquet wrap. Another way to honor your family in a vintage wedding is by using a photo frame bouquet charm. These tiny frames, which dangle from the floral arrangement like jewelry, can display photos in memory or in honor of a grandparent or an even more distant family ancestor on your wedding day. There are many choices in vintage containers to hold your reception and ceremony floral arrangements. Vintage themed weddings aren’t limited by matchy-matchy rules, so think about using a mix of delicate china teapots, antique silver urns, heirloom crystal vases, or funky retro tins. You can shop thrift stores for your vintage vases, tap family resources, or use a combination of found and inherited treasures. When using unorthodox flower containers to hold your arrangements, test them to make sure they are watertight before your wedding day. This is usually only an issue with retro tins previously used to hold cosmetics or food. Don’t exclude glassware that appears too shallow to hold flowers; your florist can use (antique!) flower frogs, or float the blossoms on water.